Porsche is a company which has been able to get by on sheer reputation for decades, never minding their incredible cars. Just thinking the name ‘Porsche’ brings images of fast, luxurious, legendary cars to the minds of car enthusiasts, and casuals alike. This type of brand recognition is what marketers dream of. Porsche’s move to the online world, and expansion into social media, had to follow this brand image. Porsche, with their enormous marketing budget, certainly has lived up to this. Not only have they lived up to it, but they have shown us a coordinated and complete online marketing campaign which we can all learn from. In the marketing world there’s a bit of jargon we use to describe our focus for a marketing campaign: the communicated article. This refers to the specific ‘item’ we are trying to advertise as part of a complete campaign. 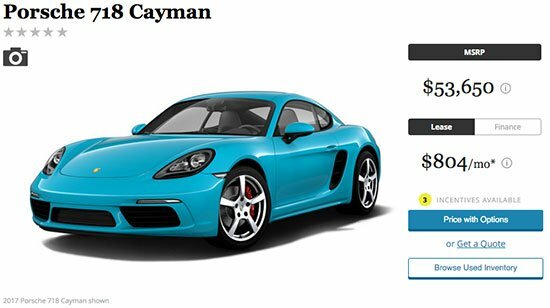 Pay attention, because you’ll see that they use these themes, the Miami blue 718 Cayman and the phrase, over and over in their entire online marketing campaign right now. 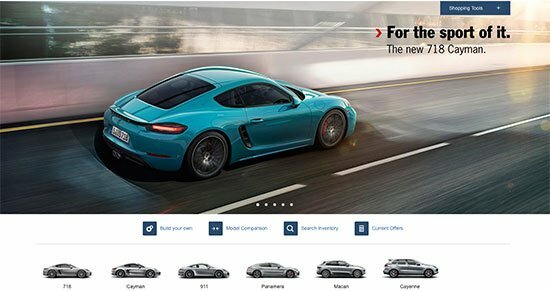 It’s just an online tool for Porsche owners to create and order their car …right? Well, it’s also an opportunity for Porsche to have user-generated content created and shared for them by their fans, and I can tell you for a personal fact that it can eat up a lot of a user’s time on their content. More importantly, it’s a very popular tool for bloggers creating their ideal ‘spec’ for each model as well. Think about this: Porsche certainly makes some money selling their cars. There’s no doubt about that. But they also make money off of selling their image, or branding. This means licensing deals for everything from socks, to coffee mugs, to leather jackets. Every tweet, Facebook post, Pinterest pin, blog article, and other social media shares (more on those next) using this personalized, user-generated creation builds deeper brand loyalty. The person may not buy a Porsche, but they may just buy that leather jacket with the licensed Porsche logo thanks to this personal interaction. Given Twitter’s short-sighted nature, and Porsche’s more refined and involved brand image, Twitter isn’t exactly their best fit. What they have done with their Facebook is take extra time, space, and characters afforded to them and dive deeper into their brand storytelling. You can see in posts they share about the 718 Cayman after this that they keep pushing the EU6 emissions compliance. This is hammering home the message behind the branding about how Porsche wants to create performance cars with better environmental impacts. 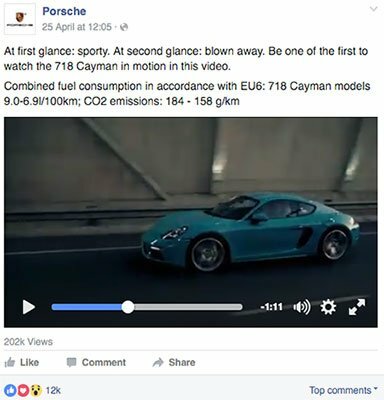 Facebook is a better fit for Porsche’s particular marketing style. Posts are less frequent than Twitter, and allow you to convey more information at once. Porsche isn’t a rapid-fire brand. They’re considered. Refined. Stylish. This is a lesson in focusing on which social platform you should choose for your particular brand. If you can’t do it all, focus on the right one. Porsche has lots of online video. The Facebook post above was one of many online videos using Facebook’s native video platform. Their Twitter account is also filled with online video. But we all know that YouTube is the true home of video online. Everyone who visits their homepage sees that video first and learns about the new car. They have a focus for their entire online marketing campaign and do not waiver from it on any platform at any moment. This is what online video should do for any brand. It should give your fans and potential buyers a way to experience your products on another level. Let’s see and hear your car. Let’s see someone build a deck from your lumber. Let’s see how your shoes look while walking with those pants on. Online video is not about creating online commercials. It’s about creating online opportunities for the online community to learn something about your products which can’t be learned from an image. If you haven’t figured it out by now, Porsche’s approach to online marketing centers around pushing one product at a time. This communicated article is featured in all of the most prominent areas of their online marketing – such as being a website site feature image, and as social media header images – to make sure that people learn their current marketing message. You can, and should, use this tactic as well. The entire online marketing world should be seen as one. You shouldn’t have a Twitter plan, a YouTube plan, and a website plan which are disconnected. Each part should contribute to a greater whole to help anyone clicking around your content, the most interested people, what you want them to learn the most. Matthew is an online marketing writer, contributing to the Devumi blog every Friday. Stop by just before your weekend starts to have what is always a fun, and informative, look at social media marketing. 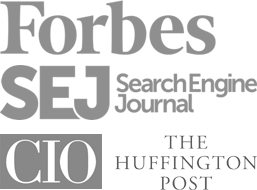 Expect great looking posts with plenty of embedded content! Follow the @Devumi Gorilla on Twitter as well!